Every month the one of the contributors over on the Art Jewelry Elements blog gives away some sort of art bead or component for their fellows and a couple of lucky winners to design with. I was lucky enough to be one of three guest chosen to receive one of Kristi Bowman's amazing Goddess Vessel pendants and I was over the moon when I found out the news. 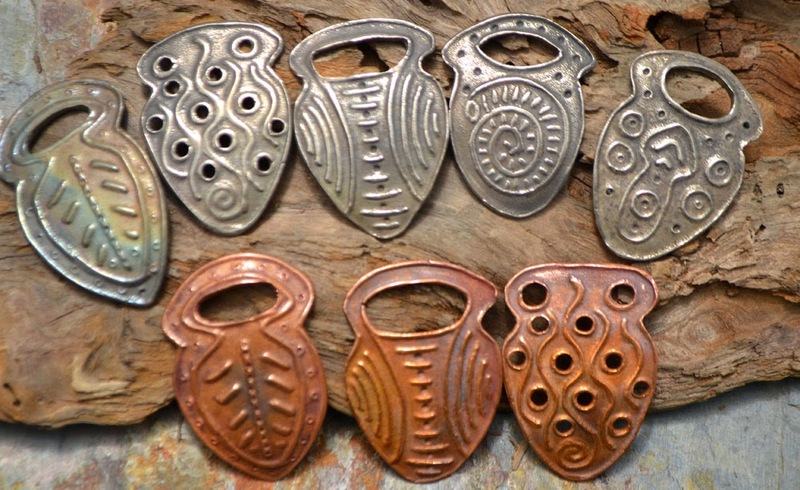 These gorgeous pieces are made from copper and white copper. I got the copper one in the middle and I love it! And of course I forgot to take a picture of it before I started working on my project. The first thing I thought of to pair with my vessel was a strand of cool triangular Petrified Green Opal (or possibly copper green opal) that I've been hoarding forever. The pendant was hefty enough to stand up to the over sized stone (I knew I wanted to add just one. Originally I thought I'd do an asymmetrical design with the large stone off to one side and balance with some other gemstones, but eventually scrapped that idea. At my husbands suggestion, I decided to wire wrap the stone to the pendant for an even bigger focal! Go big or go home, right? I then wire wrapped a bunch of faceted petrified green opal stones along with a couple of copper pineapple beads to make the body of the necklace. I'm still debating if I should have kept going and done another few sets of bead units, but I'm in a time crunch so the design will have to stand for now. I love the colors in the stones and the rustic, earthy feel of the finished design. This is a blog hop. Check out what everyone else made this month! The stones you chose are perfect for the component. Love the choice to go bigger by adding to your focal. Really gorgeous, rustic design! That's a beautiful design Sarajo, I love semi precious stones... the bigger the better! very cool design! I love how you wired the bead to the focal! I'm rather envious of those who can make wire do what they tell it to do...Love this design, and that green really, really plays nice with the pendant! Great job SaraJo! Love the green paired with the copper! Thanks for playing along with us this month! Your design is great! I haven't seen a single thing I don't love with Kristi's goddess vessels. I might need one for myself! Hi Sarajo, You chose your stone well. It looks great with that focal. Good job girl. I love everything, the stone is especially fab! But the best is the linear quality of the wire wrap echoing the designs In the pendant!!! Green and copper are one of my favorite combinations! Gorgeous! Newsletter Signup and a Giveaway!